MED e-care offer a modular suite of cutting edge solutions supporting you to deliver, record and analyse excellent care at every stage of the resident care life-cycle. Whilst meeting CQC/regulatory requirements and driving quality improvements. Our solutions combine to create a seamless, flexible, electronic health record that can be easily adjusted to reflect the needs of your residents, carers, nurses and organisation. We won’t rest until you have realised the significant benefits of MED e-care’s solutions and when you’ve reached that point, we’ll carry on helping you improve in the long term. 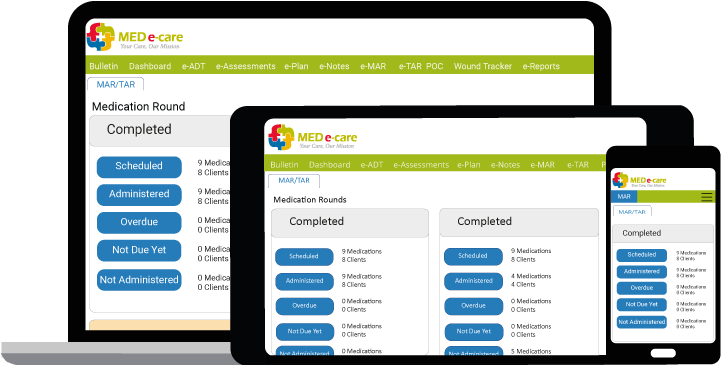 Watch the videos below to see how MED e-care can be the solution to all of your medication management and care planning needs. Interested in our products or services? Book a FREE demo, at a date and time that suits you. Just click the button and fill out the simple form and we will get back to you in 48 hours. Realise your care homes potential with our bespoke eMAR and Care Planning solutions to suit all your documentation needs.